Da Capo Press, 9780201407983, 624pp. Alabama Governor George Wallace captured the national spotlight in fiery opposition to civil rights as one of the last great demagogues of the Jim Crow South. That image, however, has overshadowed his other and more lasting significance--as spokesman for a tide of working-class resentment and general opposition to big, intrusive government that persists to this day. As historian Alan Brinkley wrote in the New York Times, Wallace emerges in this biography as "the first of a new breed of protest politicians, the first to articulate themes that have no inherent racial content and that have now become a staple of American politics, having shaped every national campaign from Richard Nixon's in 1968 to Bill Clinton's and Ross Perot's in 1992." 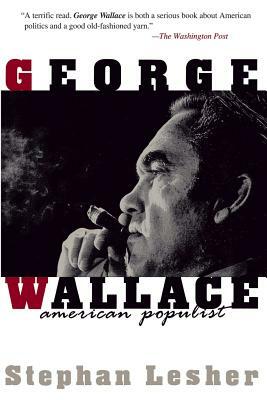 George Wallace explores the origins of Wallace's racism, his relentless dedication to his own political advancement, the influence of his public life on the nation, and his role as the embodiment of the dark side of our nation's politics--for America made George Wallace, not the other way around. As a correspondent for Newsweek, as well as a number of Southern dailies, Stephen Lesher covered Wallace from the time of the Montgomery boycott to the end of his political career. He is the author of A Coronary Event and Media Unbound, among other books.